There are more Fathers Day photos still on the camera. I am almost sure that either Cuppa, I or both of us will publish a further post. This entry was posted in Family and Photos, Grandchildren and tagged fathers day, nikki dee, photos. Bookmark the permalink. That is an absolutely gorgeous photo, AC! And I like the B&W-color effect. Marvellous! 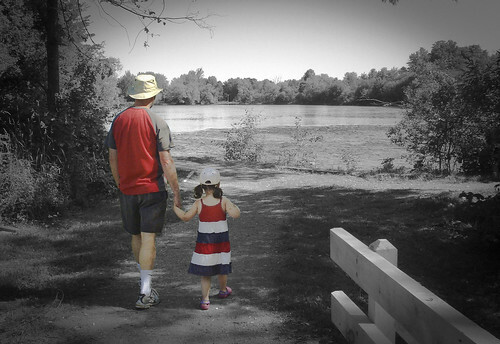 Love the photo and the father and daughter pair. What a cool shot! Love the effect Ac! Can’t wait to see the other photos! I really like that effect, how do you do that? What software do you use? I like colour select too. This picture looks almost 3 dimensional. Nicely done. Nicely done! It looks like you’re walking right into an enchanted spot. AC, yes I agree with everyone – GREAT shot all by itself, but the B&W and color mixed together make this outstanding. OK, tell us HOW is it done so we can experiment too one day. Of course, it’s great to have such a nice granddaughter to help create the scene. That’s a terrific photo! Love the selective colouring too. Well I’ll tell ya AC, it looks like you and ND are walking on to a movie set! Sort of reminds me of “The Wizard of Oz”. I really like it. Jake wasn’t home for Fathers Day so we will be celebrating this upcoming weekend. Lovely photo. Is the red, white and blue theme significant? The film technique give the photo a dream like quality.